Baby Shower games are the center of any good baby shower. Some are silly, some are fun and some will get everyone laughing or crying (you know the good emotional type of crying). There is a huge variety of free baby shower games like baby shower bingo, word searches, mad libs, free printable baby shower game, you can even make the games be gift related that they can keep! Be sure to stock up on fun prizes, simple prizes make baby shower games a lot more fun and get the competition motivated. 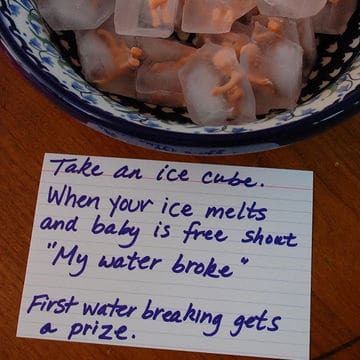 The beauty of this game, Baby in an ice cube is that it’s ridiculously easy for you, and well, a little funny, especially if you’re having a co-ed shower! The Don’t Say Baby game is easy to incorporate because it flows throughout the shower with little effort. 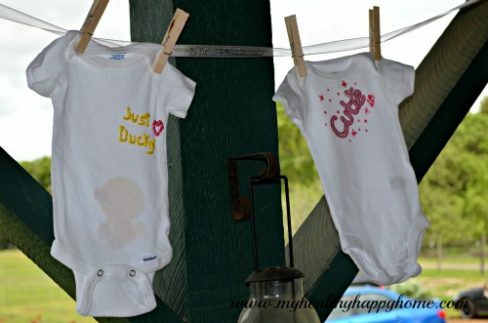 Make a Onesie Decoration Station! The only thing better than celebrating someone you love is thinking about that adorable baby that’ll be rockin’ a onesie you made for him! Baby Product price is right. Baby products cost a lot! Have a little fun guessing just how much! Bob Barker fan or not, a little challenge is enough to get anyone to compete! Who Knows Mommy Best? All you need is a Paper and pen for each guest. All you need to do is find out as much as possible about the mother-to-be’s childhood. Write your questions and her answers down on a sheet of paper, and don’t show anyone. 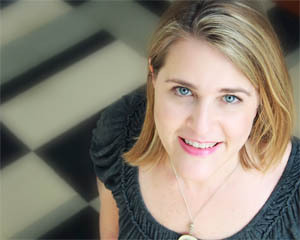 To play, go down the list of questions and have the guests write their answers down on paper. Whoever has the highest number of correct answers wins. Name that tune. You will need a playlist of baby songs and pen and paper. Play one children’s song at a time and keep track of who can accurately guess each song name the fastest. Whoever has the most correct responses wins. New Mom Advice- Give the Mom a new notebook. Have everyone take a turn sharing their best baby advice and have them write in the notebook for future reference. Things like, “don’t potty train till age three”. Who Am I? – Can your guests guess which famous mother is pinned to their back? They’ll have to ask the other guests questions to figure it out. What’s In Your Purse – Give out points for common items found in women’s purse. This is commonly played as the first game at a baby shower. For the Love of George shares this fun Celebrity Baby Name Game where you match the baby to the celebrity couple. Perfect for a couples shower and it’s gender neutral. This Celebrity Mom Edition game by Numann to Sowers is a mix between Catchphrase and Taboo. Two teams are given 5 cards with the names of famous/celebrity moms. One person on the team will be trying to describe the name on the card without saying the names while the other person has one minute to try to guess as many of the 5 cards as they can. Baby Animal Name Game. 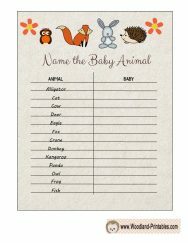 Each guest gets their own paper and has to see how many of the actual names of the Baby Animals by Woodland Printables they know. 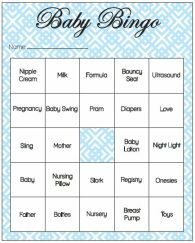 This Baby Shower Bingo Game by Catch My Party is designed in both a boy and a girl version. Both sets include instructions and seven different bingo cards. Buttons make perfect box markers. Baby Shower Word Search. 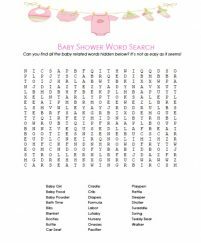 How many baby related words can you find in this Baby Shower Word Search by E Baby Shower Games? 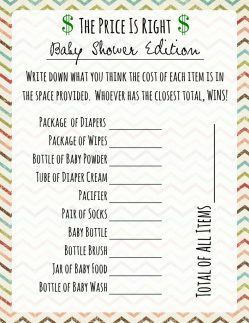 Download the template, print out one game sheet for each baby shower guest then have them find as many words as they can. Available in pink, blue or neutral. 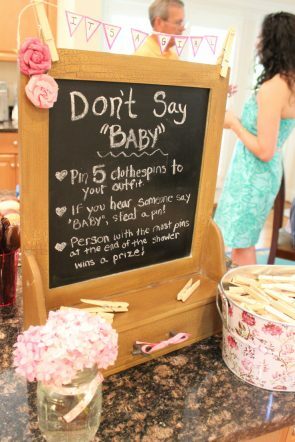 Here are some common questions you might have if you are hosting a baby shower. How long should a shower last? I am a big believer in not creating long showers. Keep a shower under two hours. Another idea is to create an open house shower, which allows people to drop in and leave. What are good prizes for baby shower games? I like to give a few favorite things out. This way if someone doesn’t win they can still write down the favorite product ideas. Here are some Baby Shower foods, you might want to incorporate. 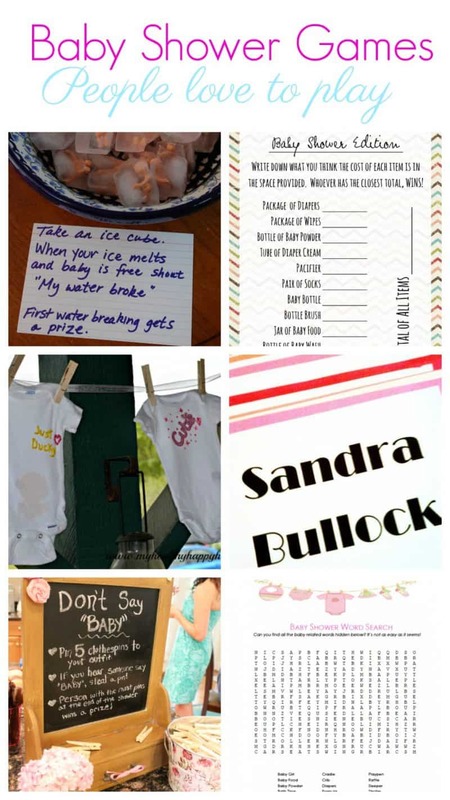 You might also like these five fabulous baby shower ideas and themes. 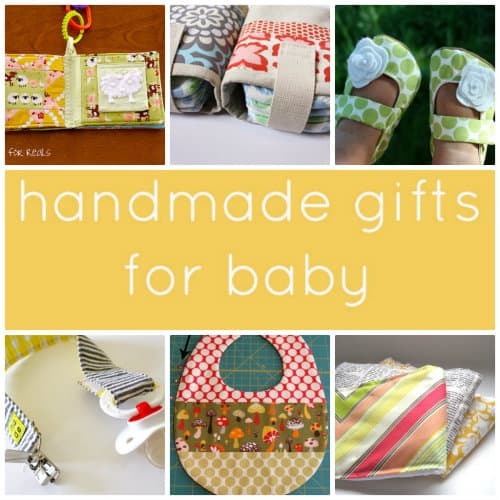 If you need some fabulous gift ideas these handmade baby gift ideas are so thoughtful! Nothing is more special than a handmade gift. 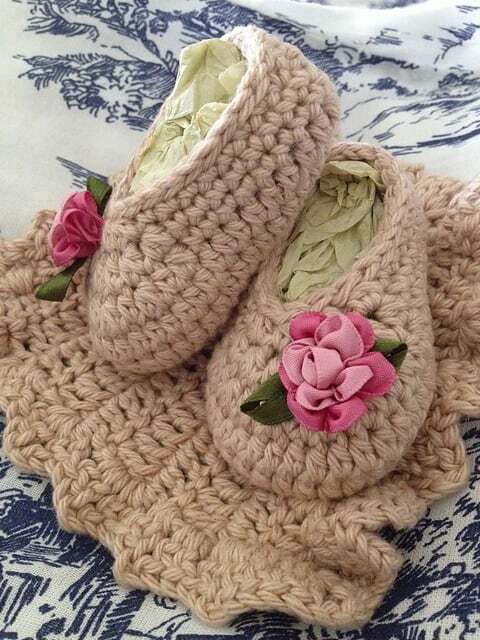 If you like to crochet these crochet baby booties are so special and they are just one of several beautiful ideas you can make.